With classic styling borrowed from Eastern Europe and the Mediterranean, the Trevi® collection makes a statement about grandeur. With inspiration taken from the ancient town in Umbria, Italy, the pieces are all reminiscent of traditional Italian design elegance. Skilled craftsmen and artisans have artistically weaved together the Birch solids, Ash Burl veneers, marble tops, and smoked glass that is seen throughout the collection. Each piece has that unique feel to it that gives a sense of being one of a kind. The formal dining room table emulates a cradle effect and seats up to 12 people comfortably, perfect for large family gatherings. The chairs are resplendent with the qualities of a throne, as they feature cabriole legs and bombe fronts. 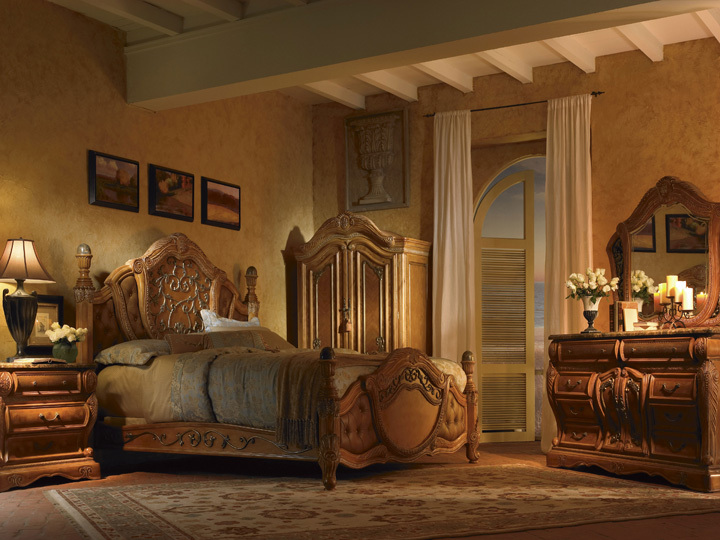 The master bedroom showcases a regal poster bed, with tufted leather surrounding a shield motif on the headboard. The sleigh bed's stunning design allows it to be placed in the center of a room or against a wall. Finally, the case goods feature metal marquetry, acid etched patterned drawers, cabriole legs and bombe fronts, bringing home the supreme elegance of classic taste. Bathed in a creamy Latte Finish, Trevi® is a truly majestic collection that will make people feel as though they are standing in Italy.